Tell your legislators: vote for the Fair Share Amendment! To help working families and build a stronger economy for us all, we need to invest in quality public schools, affordable public higher education, and a transportation system that works. The Fair Share Amendment is our chance to make those investments. It would raise almost $2 billion in new funds for transportation and public education, all by requiring that millionaires pay an additional tax of 4 percentage points on their annual income above $1 million. The next crucial step is very soon: Wednesday, May 18. 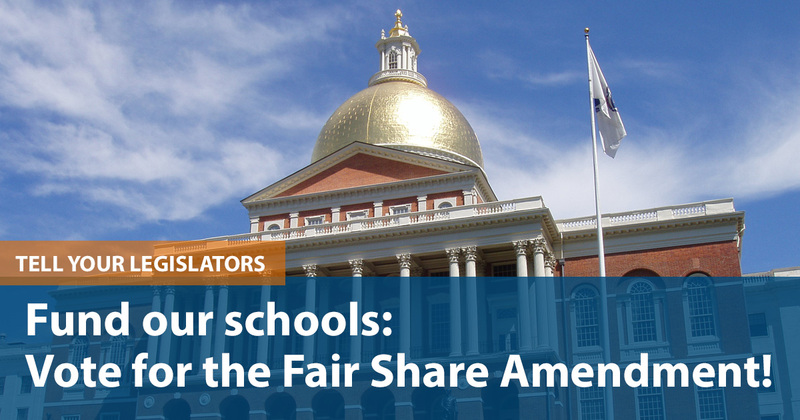 The Massachusetts legislature will vote that day to advance the Fair Share Amendment to the ballot in 2018. The Raise UP Massachusetts Coalition can't do this without your help. There are things you can do, to help, starting with sending a message to your legislators. Step 1: Send a message to your legislators.